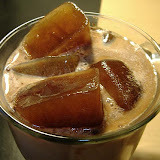 Time for another edition of Coffee/Tea/Chocolate in the Movies. I pulled out one of my favorites: Jane Austen's Pride & Prejudice, but this is an older version produced by BBC as a series. I found it on DVD in the Jane Austen Collection (which also includes BBC versions of Sense & Sensibility, Emma, Persuasion, Mansfield Park, & Northanger Abbey). Elizabeth Garvie's portrayal of Lizzie in this version is one of my very favorites. There are plenty of tea and coffee moments in the series, but a few of them are worth special note. 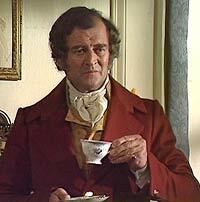 Mr. Collins Straining Over Tea. Mr. Collins' arrival at the Bennet house creates quite a stir. He's a wonderfully obnoxious character. He is obnoxious over dinner, obnoxious during cards, and obnoxious during the dance. But this scene finds him unusually quiet. The reason? He has proposed to Lizzie's best friend but has been sworn to silence on the subject. 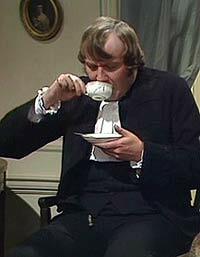 The use of tea in this scene gives them all something to do while we watch him attempting to hold back his natural tendency to brag, which in this case is really straining his buttons. 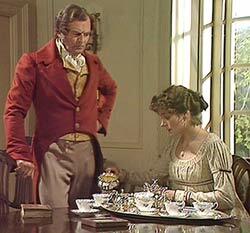 Upon his return from London where he has unsuccessfully sought his youngest daughter, Mr. Bennet requests to take his tea with Lizzie alone. We assume he needs some rational counsel, and probably the comfort he gets from the daughter he loves best. Lizzie pours while he tells her of his trip and his regrets. 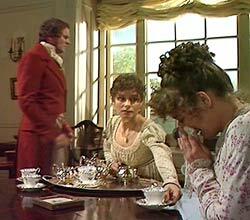 Mr. Bennet calls Kitty in, to give her his new rules regarding officers in the house, and her rather bleak social future, which reduces her to tears. Lizzie offers her a cup of tea for comfort and sympathy.